Children are often taught that government protects our life, liberty, and property, but could it be true that some laws actually allow people to hurt us and take are things? Join Ethan and Emily Tuttle as they learn about property, pirates, and plunder. With the help of their neighbor Fred, the twins will need to figure out what they can do to stop the bad guys in the government. Frédéric Bastiat (1801-1850) was a French political economist and classical liberal who wrote The Law, upon which this book is based. 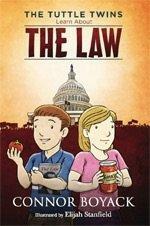 Through fun illustrations and in engaging dialogue, young readers will be led to understand the principles of liberty and the proper role of government.